Our short messaging service lets you send and receive text messages from your computer via a short code number. Deliver your marketing text messages, notifications or SMS alerts to a large audience via our online short messaging service gateway. Voodoo SMS is one of the UK's top online SMS providers. Using our platform, you can send out bulk SMS messages to your entire audience of customers, clients or prospects with competitive, volume-based pricing. Short message service (typically shortened to "SMS") is a messaging channel between mobile phones. Most people refer to short messaging services as “SMS” or “text messages”, since the full technical name isn't quite as convenient to stay or write. Our short messaging service lets you send and receive SMS online. You can send a single SMS to one of your customers, contacts or acquaintances, or deliver bulk SMS messages to a list of opt-in prospects, existing customers or mobile app users. Using Voodoo SMS is simple. Our platform allows you to send and receive short text messages from your computer, just as you would from a mobile phone. Instead of sending your SMS to just one person, you can broadcast it to an audience of thousands of people at once. Sending your first short message is simple. All you need to do is import your marketing list and create your message. Once you've funded your account, you can send your SMS as an instant broadcast to your entire audience or send it to different people in small batches. We offer competitive pricing that gets more affordable the more SMS you send. Thanks to our volume-based pricing, you can pay as little as 1.74p per short message delivered to your target audience using Voodoo SMS. Our platform is fully compliant with dynamic SMS, allowing you to send customised messages to your target audience. With Voodoo SMS, you can add variables like the recipient's name, ID and more to your messages to improve personalisation and increase your response rate. Instead of sending messages from your long phone number, you can send your texts from our SMS short code. You can even pair our short code number with your custom promotional code to encourage recipients to respond to your campaign. 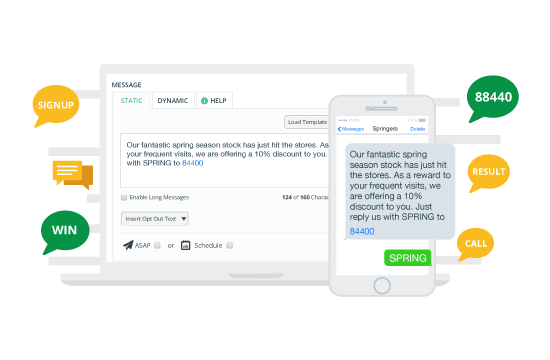 Using an SMS shortcode makes your message stand out in the recipient's inbox, increasing the rate at which people respond to your SMS campaign and opt-in to your promotion. Our volume-based pricing means you pay less for each SMS the more you send. We have no minimum funding requirement, meaning you can fund your account to send just a single text if you'd like to test Voodoo SMS before sending a larger broadcast. Thanks to our volume-based pricing, you can send SMS messages online from as little as 1.74p per message. View our pricing information to learn more about how little it costs to launch your text messaging campaign with Voodoo SMS. Our powerful SMS platform lets you import your target audience and start sending SMS straight away. Create your account now and start using Voodoo SMS to keep in touch with your mobile app users, marketing prospects, customers and more.